I am alone at home today. My husband has gone to visit his family, providing me with the rare treat of having the house to myself to veg out in as I see fit. I am using this time to clean up this blog and am creating new tabs so it’s easier for people to search and find recipes. Unfortunately, as I have been away lots and as he has also been very busy filming and editing, there is barely any food in the cupboard or fridge. Normally, this would mean that I would automatically turn to my instant noodle cupboard but the prospect of that today just wasn’t very satisfying. I was therefore shaking my head slightly in despair until I looked out the window and spied the beautiful flowers blooming on the sage growing in the garden, which formed the inspiration for today’s unexpected post and recipe. I have made crispy sage before (I love it) and decided to fry some again to have with some pasta. I guess spaghetti isn’t too far off from the traditional noodles I would have normally had anyway but combined with some toasted pine nuts, lemon juice and parmesan, I’m pleased I ended up with a very simple but enjoyable lunch which I could eat using nothing more than a plate and fork. 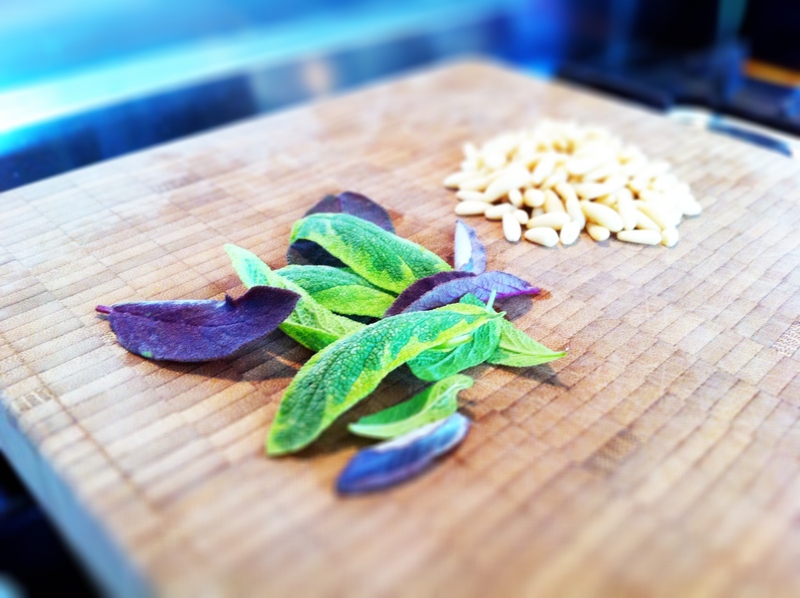 Fresh sage from the garden (two varieties) and some pine nuts. 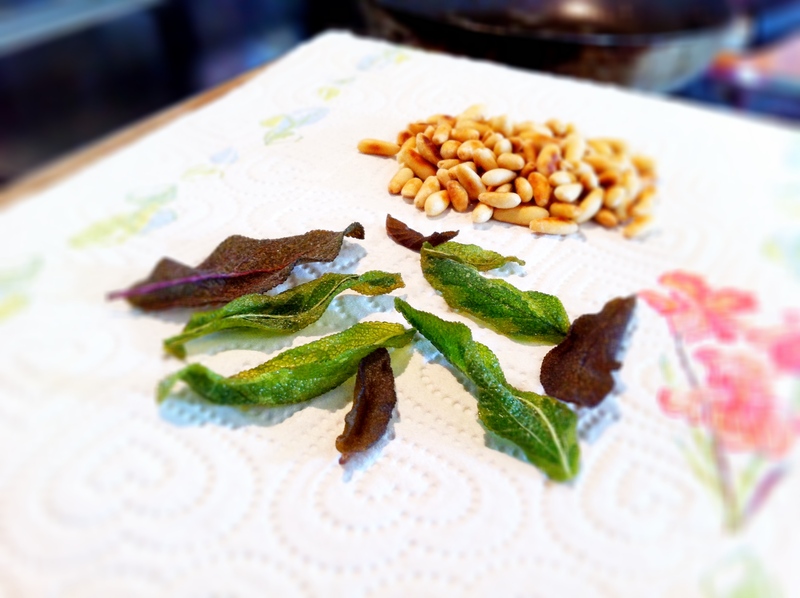 Takes just a couple of minutes to toast the nuts and fry the sage leaves to make them crispy. 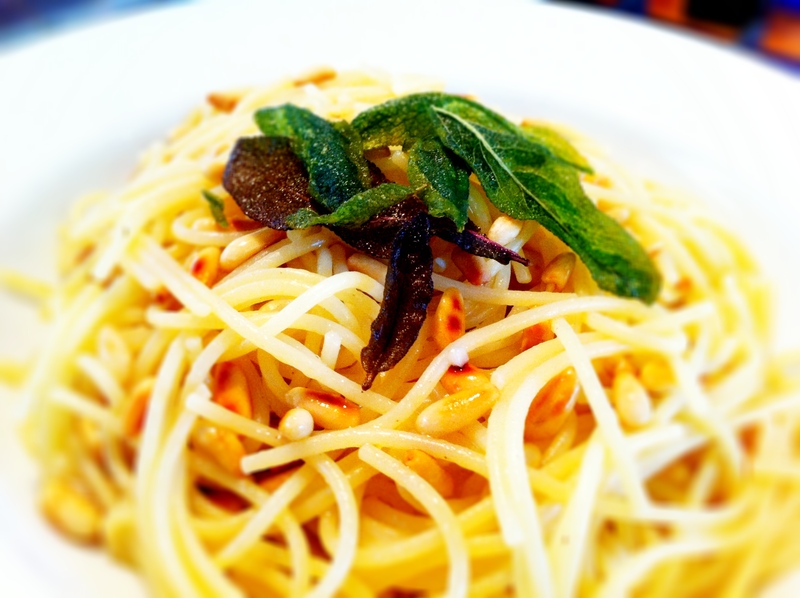 15 minutes is all you need to make this crispy sage and pine nut pasta. Hope you’ll enjoy this simple recipe and the soon-to-be tidier site. Simple summer pasta for one. Click here for the printer-friendlier recipe. Sage, pine nuts, lemon juice and parmesan. Simple. 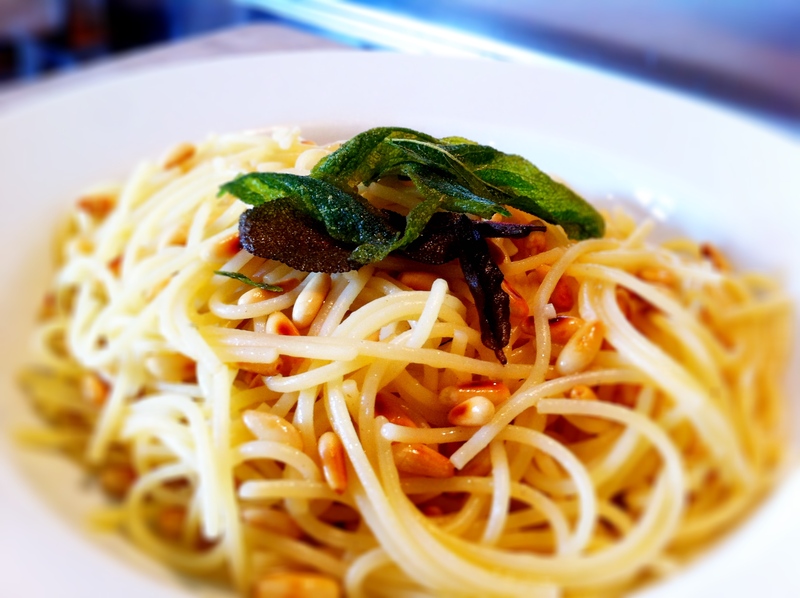 Sage and pine nuts – what a great flavor combo. YUM. 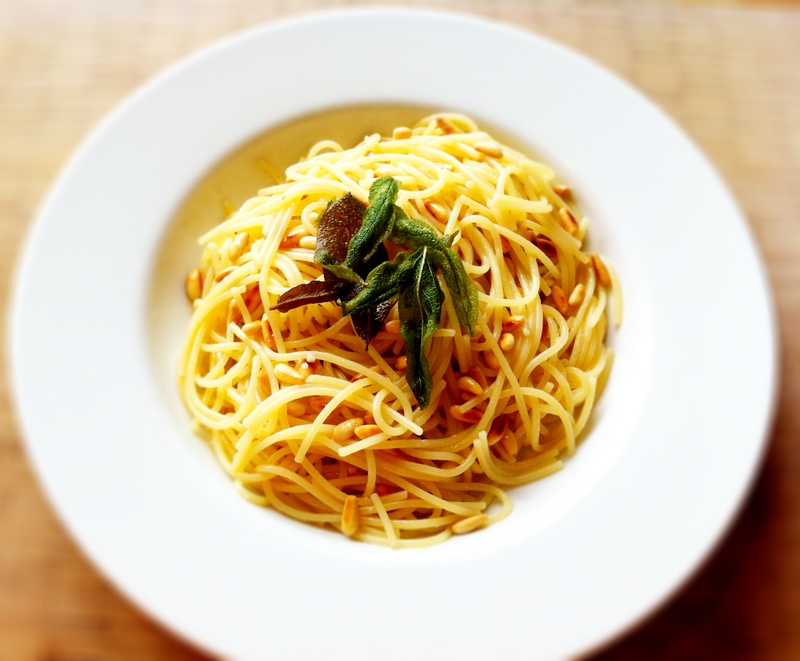 SImple pastas like this are the best! A great recipe! 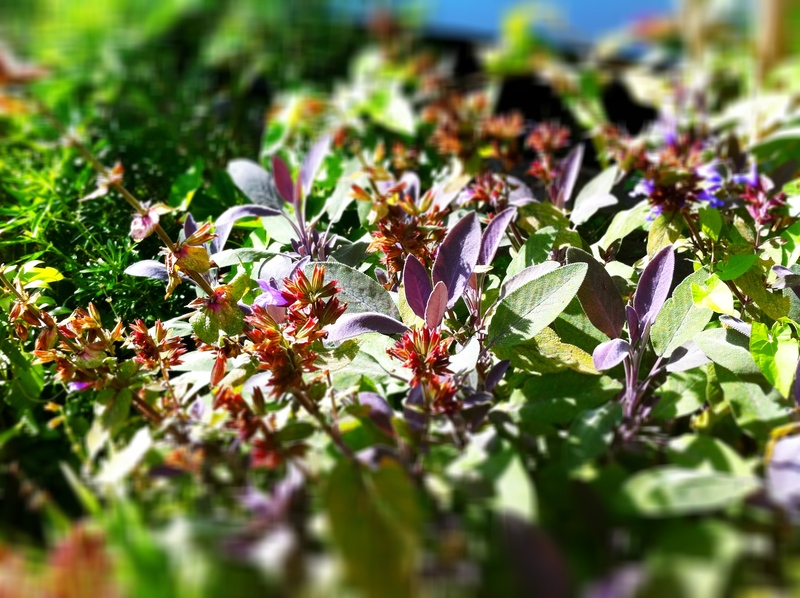 Sage is about the only thing that is growing in our herb garden this dry, hot summer. Great idea! What a delicious and quick lunch! So fancy, too!